I had some time tonight to make a few small updates to Elly. Todays update of Elly, added first draft of Hair. I didn’t have so much time to work with this tonight, but since yesterday I have done a few things anyway. I cleaned up some more of the textures, and improved the skin shading network with some additional subtle SSS added to it to get a warmer tone to softer parts of the skin. 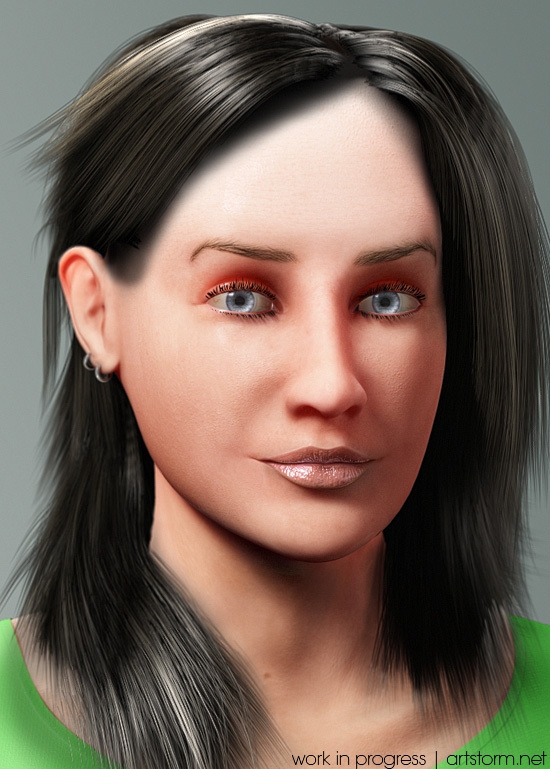 I tweaked her left eyebrow a tiny bit so they are not completely symmetrical, and finally made some hair render tests of the hair guides I’ve been working on for her, rendered with FiberFX in LightWave. I still have to do quite some more work to the guides, as well as work on the hair material. The shadow from the hair for the above render is pretty rough, so it looks a bit soft and strange in some regions. I will raise the quality of the shadow when I have all guides in place where I want them. That’s it for tonight, a few tips will follow below, other than that, I hope I have some more time tomorrow to spend on this project. 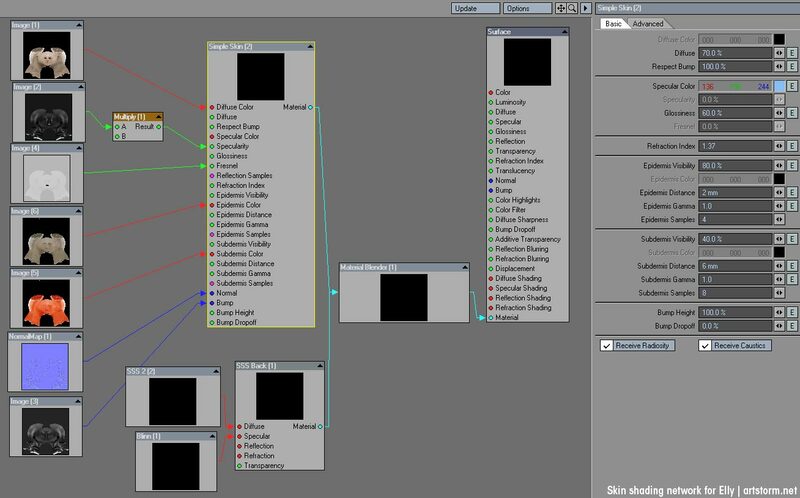 Here is my node network for the Simple Skin material I have used on Elly together with the settings for the Simple Skin material. Many settings are driven by texture maps, which I have painted in ZBrush. I have also blended in the SSS2 shader for some additional SubSurface Scattering control. I love the SSS2 shader, so fast with beautiful quality. Here’s a small LScript, which simply allows you to add FiberFX to your layout menus. If you use FiberFX often like I do, it can come in handy. It’s much faster to have FiberFX attached to a button than to have to Ctrl+F8, drop down the menu, select FiberFilter then double click. This script does that, and when FiberFX is added to the scene, it opens the FiberFX panel with the button. I find it to be a convenient time saver and I have added it to my Workflow tab in Layout where I have all my most used tools collected. It’s getting there…! Since it’s WIP you probably have a plan for the irregular eyelashes and split ends of the hair. I haven’t had the time to continue with this for a few days, but I’ll probably finish the character next week, with some radical updates to the everything hair on her. Some things with the geometry and textures have been bothering me as well, so gonna polish them some more. Haha, and about Dr Alban. That tape must have been suppressed from the memory banks of my mind keeping the state of those bits and bytes. Can’t really recollect, it was a physical tape, not something put onto some Amiga music disks or similar?